Whenever we went back to Taiwan, we always stayed in Taichung. My husband’s home town Puli is 90 minutes away. 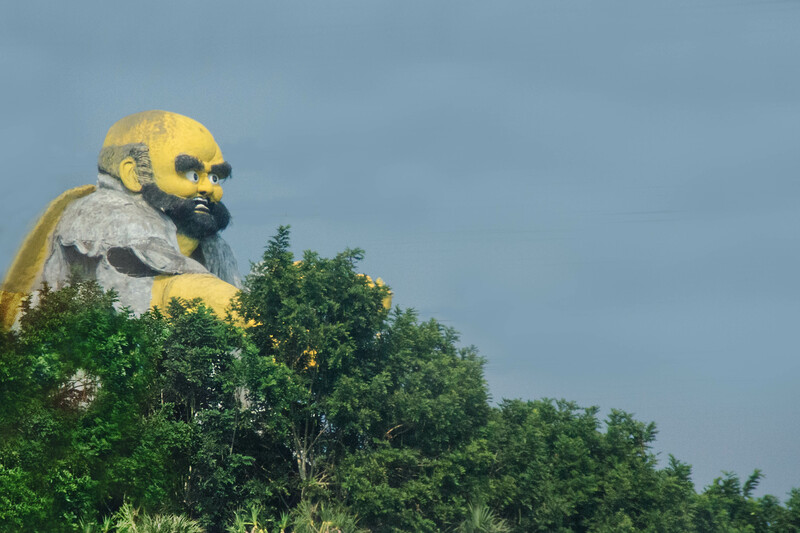 On our way driving to Puli, I saw Bodhidharma statue far away, on top of a hill. I wanted to take a photo, but there was no place to stop, so many photos didn’t turn out good. This is one of the best. I love this! He watches over the town? This is such a cool shot. How fun to have him protecting the town. Good grief, he looks mad. I like this one! The expression is cool. It looks huge, is it? What a huge guy! He does look a bit angry…I hope he is a kind (really big) Bodhidharma!! I do like his bushy eye brows!! Wow – is he as huge as he looks?!! !